BEDFORD—The Bedford County Safety and Wellness Committee will once again be hosting their Health and Community Resource Fair. The event is set to feature dozens of organizations who will be providing resources and services to the public. County offices will open their offices up as well to let the public know what their office does and can provide to them. The Health and Community Resource Fair will be held on June 8th from 10:00am until 1:00pm on the 1st floor of the Bedford County Courthouse. 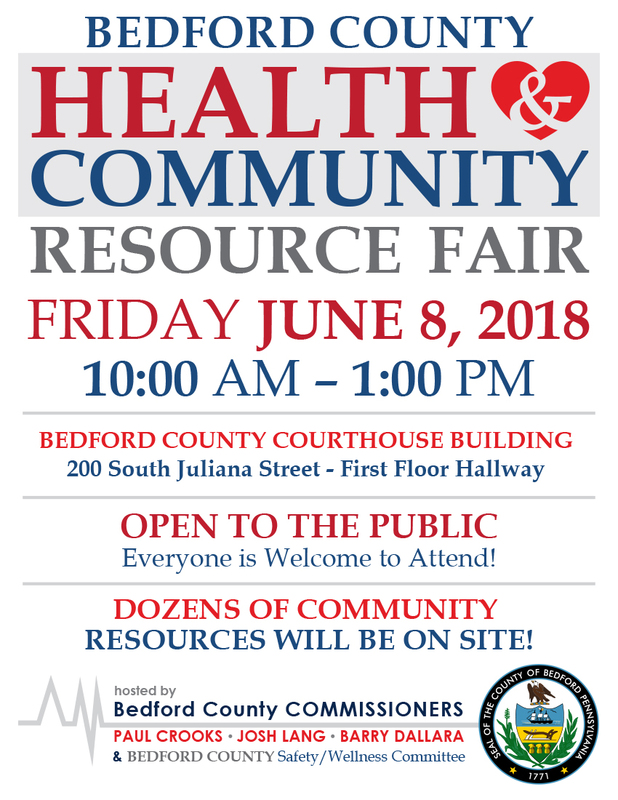 The Bedford County Health and Community Resource Fair will allow County departments, agencies, community organizations, and non-profits the opportunity to showcase and inform the public about the resources they have available. “Providing resources and services to the public is one of the County’s core functions. The Health and Community Resource Fair will give community organizations and County offices the opportunity to provide resources and information to the public. The more that we can inform the public about the resources that are available in our community the more educated our community can be. As a County, we want to help facilitate people in the community getting the services they need,” said Commissioner Chairman Josh Lang. Community organizations are highly encouraged to participate. For more information on how you can become an exhibitor contact Laurie Staub at (814) 623-4812 or email lstaub@bedfordcountypa.org.